Or, RAVEN RIDES NETHERLANDS AND GERMANY! 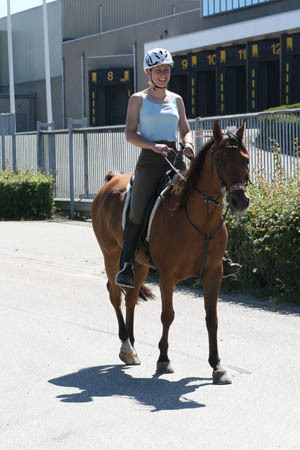 Or, Merri Rides Arasier in Netherlands and Germany! One of the horses with the Dutch endurance riders that caught my eye was an Akhal-Teke – Thoroughbred cross, owned by Janet Lam. The mare had the very typical Akhal-Teke head, neck, and body, though you could definitely see the Thoroughbred in her, also. Janet Lam is another one who's passionate about the Akhal-Teke, and this mare Bugainvillia in particular. 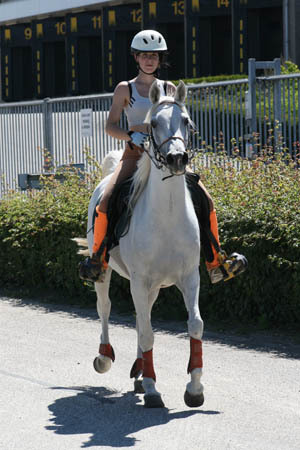 She's been riding endurance for 4 years, having started off with a Quarter Horse. The Quarter Horse was fit, but not for endurance, she discovered! She was pulled on her first ride before finishing. Janet knew she needed more of an endurance horse, and she wanted something different that not everybody had. She went to look at some Akhal-Tekes, and at Argamak Studfarm in De Wijk, Netherlands, she found a young colt and filly she was trying to decide between. The owner, Baronness Clara de Vos van Steenwijk, had Janet try riding the colt's mare, just to see what the Akhal-Tekes felt like. When Janet got on the mare, she knew immediately that was her horse. Clara said she wasn't for sale; some other people were already buying her. “I'm sorry,” Janet told her, “but I am buying this mare. I'm going home now.” And she left the farm and went home, and waited nervously for the phone call... which eventually came: the mare was hers to buy. 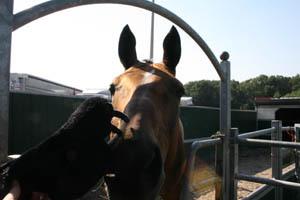 Janet loves this horse, knows she may never have another one like her. She knows she should get another endurance horse (you always need at least two to compete on! ), but she doesn't want to ride another horse. In fact, she is not sure she will even be interested in doing endurance after Bugainvillia is done with endurance riding. She would, however, love to breed her – just not right now. 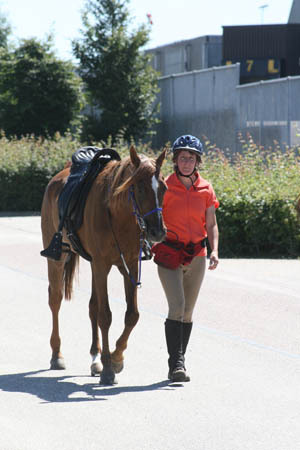 The mare this year has done a 120 km, 140 km, and 160 km ride (in the Dutch National Championships), and now she may be headed for the European Championships in Portugal. Janet has crewed a couple of years for Carmen, at European Championships and in Dubai, so she's learned a lot from that, and is now looking forward to doing her own international competitions. She appreciates these Dutch training weekends, for the support and help and knowledge she gains from the other more experienced riders. And, the Raven and I got to ride an Akhal-Teke! An Arasier actually, half Akhal-Teke, half Tersk Arabian, named Eddie R, owned by Carmen. Carmen had started riding him for a woman who wanted him to be sold to a good home and keep him competing; Carmen tried him in a ride and liked him and bought him. From the ground, Eddie R has the typical Akhal-Teke look, and from his back, he looks like “half giraffe, half greyhound,” someone said, and, I'd add, “half camel!” His neck was as long as the camel that I once rode in India, and his trot was about as long. Carmen said, “He's exhausting to ride, you have to ride him every step, keep him together or he'll go lame.” Carmen is very fit and normally never tired after a ride, but riding Eddie wears her out. He's done a 120 km, and just last week finished a 140 km ride. He's got a good heart rate that drops quickly, though it will drop to 60, instead of 40, like Carmen's Arabian mare Fadilah R. While Eddie's sure-footed, he's not so agile weaving in and out of trees in the forest with his long body. I discovered that Eddie can indeed be tiring to ride. He's got an absolutely amazing trot – effortlessly eats up the ground, and very smooth. But you have to work to stay with him, center yourself on that long back in his long trot. And Eddie was very easy-going, sauntering along behind our group, trotting along with no worries and no concerns. Until we stopped for a drink. I called after the others, “We're drinking,” but, on they trotted. Hmm, I thought... maybe I should go after them, but then, you never stop an endurance horse from drinking, especially on training rides. And Eddie had been quite relaxed, even if he fell out of sight from the horses in front of him turning a corner in the forest. Eddie had a good drink, a LONG drink, and when he looked up, the other horses were out of sight. No matter, he started walking after them, then trotting... then he LEAPED in the air! Good thing I forgot my camera, because I would have been taking pictures, and wouldn't have had both hands on the steering wheel, and I would have been launched! So ended our quiet liesurely ride! Eddie was wide awake! He leaped forward! He propped! He wanted to bolt into a run, but there was a buck in that run! Fortunately it was easy to pull his long head up (! ), but he didn't want to keep to a trot, he wanted to run! And so I had a slightly wild ride on Eddie, trying to catch up to the group, who were still trotting along ahead of us. Finally we caught up with them, but Eddie had changed. The new Eddie was quite perky, and always looking for an excuse to get into a canter – and BUCK! I kept him at his long trot – still as smooth at the faster speed – and once we did manage to get a nice canter for a few strides before he wanted to put his head down again. The Raven was having a great time in his bag on the saddle – sure, he was safe in his bag and wasn't going to get bucked off! Our trails took us in and out of Germany and the Netherlands, and we shared the trails with hikers, joggers, bikers; we passed an area for motorcross bikes (there was some serious riding going on in that pit! ), and we rode around a golf course. Oooh, I was tempted to turn Eddie upon those greens and let him run (and buck me off) but I didn't want to get Lei in trouble! 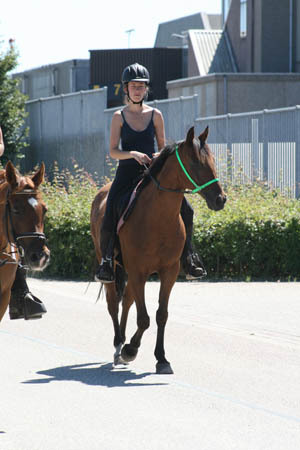 It was a lovely warm sunny day in Holland-Germany for our 3 ½ hour ride. 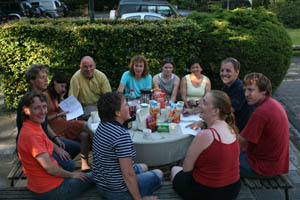 Our group of 13 had broken into 2 groups, but we all arrived back at the stables at about the same time. After a late lunch at the boyscout camp, we returned to the stables where Dr Horsmans and Mechteld inspected the horses. Returning to the boyscout camp, we ordered out for food, sat around and talked, listened to a talk by Dr Horsmans, and a talk and slideshow by Carmen, about speed riding in the UAE. Sunday morning it was another warm-up with aerobics or a hike in the woods, then another discussion session, then back to the stables. Some of the riders were going out for a ride again today, while Jeanne and I packed up, loaded her horse up, and headed for home. It was fun to participate with the Dutch team training weekend – of course I don't understand Dutch, but everyone jumped in to interpret things, and they made me feel like I fit right in with them, and it was easy for me to see the value of the team, and future members of the team, getting together. And I'd be seeing some of the Dutch riders again: I'd be going to visit Anita (and Jarmila), and going with them to the Kreuth, Germany ride next weekend; I'd see Jannet Van Wijk there; I'd see Barbara in Compeigne in 3 weekends; I'd see Janet Lam next week to visit more Akhal-Tekes; and, hopefully I'd see 6 of the riders in Portugal 5 weeks! what is the Bugainvillier 's pedigréé please ?